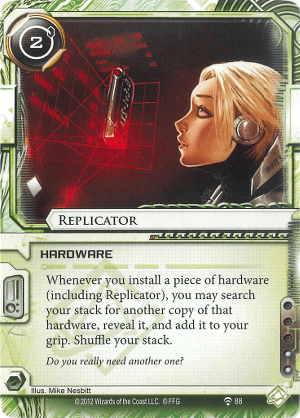 Whenever you install a piece of hardware (including Replicator), you may search your stack for another copy of that hardware, reveal it, and add it your grip. Shuffle your stack. I like replicating things and I want more things to replicate. What else can we replicate? Replicate all the things.